The great unasked question in the climate-change debate is at what point in the near-future do we string up Sean Hannity, Rush Limbaugh, and all of the other global-warming deniers from what’s left of the tallest tree? At what point will all of us, and not just scientists, know, with every fiber of our being, that the carbon emissions mankind has been adding to the atmosphere over the last 150 years is creating a greenhouse effect that is in fact, and not in theory, warming the planet, melting the glaciers, rising sea levels, and creating weather-related havoc around the globe? Before it’s too late? After it’s too late? And if the latter, how will we view those who have denied all along that it was ever occurring? Last week, these same guys kept denying the poll numbers of statisticians like Nate Silver until Barack Obama, their bete noir both figuratively and literally, was reelected president of the United States. Silver has a book out called “The Signal and the Noise.” It’s about polls and poll numbers but the title could be about the greenhouse effect and global warming. For decades scientists have been listening to the signal and climate-change deniers have been providing the noise, but the question no one asks these guys, the Hannitys and Limbaughs, is this: If you’re wrong, and if we move too late, how will you not be viewed as the greatest villains in human history? Forgive the screed but the other night I watched “Chasing Ice,” a documentary by Jeff Orlowski about National Geographic photographer James Balog, who, with a young, international team, has spent the last five years documenting, via time-lapse photography, the melting of glaciers in Iceland, Greenland, Alaska, and Montana. This melting is speeding up. What took 100 years in the 20th century is taking 8-10 in the 21st. They also record, through luck or patience, the “calving” of huge chunks of glaciers. The first time we see it, early in the film, we don’t quite get what we’re watching. The glacier is rumbling and shifting, almost as if it’s alive, as if it’s rousing itself, but in what direction? Then suddenly we understand. A monumental slab of ice breaks away, shifting forward at the bottom, and falling backward. It almost looks like it’s lying down for a nap. Then it just disappears. The last such slab we see disappearing in this manner is the size of Manhattan. Balog began life as a scientist but didn’t like the fussy calculations, the stultifying lab-ness of it all, and at the age of 25 reinvented himself as a nature photographer. He didn’t know anything about photography, but, he says, “Youthful brashness can take you a long way.” He was particularly interested in how humans and nature intersected. For a time he focused on endangered wildlife. He liked taking shots at night for its absence of sheltering sky. The vastness of the night sky reminds us of what we are and where we are and what we’re on. It reminds us of the fragility of our existence. He began as a climate-change skeptic. He couldn’t see how humans, despite their number, could have an impact on something as vast as the world. But he became interested in ice—in photographing it, in the beauty of it—and came to the story that way. “The story is in the ice somehow,” he says in the doc. I saw the doc with friends and some in the group, particularly the women, were put off by Balog. They felt the doc was too much about him when it should have been about it. They thought he took too many unnecessary risks for photographs that don’t have anything to do with global warming. For a time in the doc, the focus even becomes his knee. He’s had two surgeries on it, gets another, is told he can’t hike anymore. Yet there he is back in Greenland and Iceland and Alaska, traipsing through the snow to his cameras, and rappelling down ravines for that perfect shot. Until he can’t anymore. All of which is gloriously beside-the-point. If we’re talking about the end of the world as we know it, what’s James Balog’s knee in this equation? Nothing. The knee is only there for false drama. It doesn’t matter who goes to the cameras, as long as that evidence is got. If we have pictures, we have everything. And we have pictures. We know we will. Otherwise why are we sitting in a theater watching this thing? The documentary wouldn’t have been distributed without them. When we finally see the time-lapse photographs of the glaciers melting, it’s horrifying. It’s like watching beauty and grandeur melt away. One feels sick to one’s stomach. One wonders why it isn’t on the news and in the newspapers and on the web. But of course it is. It’s just not central to the news and the newspapers and the web. It’s not trending. Global warming has always had trouble as a cause because it’s a completely abstract phenomenon. Every few months we’ll get a natural disaster, which may or may not be attributed to climate change, but that’s about it. It’s a slow process, whose ends are unknown, which we may or may not be causing. What Balog does is provide specific evidence. He makes it real. This is what’s being lost. These glaciers. This beauty. It’s like watching the Louvre and La Sagrada Familia and the Great Wall of China melting because of something we did, and do, and don’t care enough to stop. The greenhouse theory holds that carbon dioxide, the waste gas released by burning coal, oil and gas, does for the planet what glass does for a greenhouse  lets the sun's warmth in but not back out again. Until the industrial revolution, excess CO2 was absorbed in the oceans. Now the gas is accumulating rapidly in the atmosphere. The climatologists predict that present levels of CO2 will double in the next 50 to 70 years, raising global surface temperatures an average of three degrees. This was the hypothesis but there was no evidence to back it up. In the above editorial, called “Waiting for the Greenhouse Effect,” the Times’ editorial board wrote, “There is no cause for panic, but there are plenty of reasons for prudence.” They wrote, “Until there is indubitable proof of a global warming caused by CO2, the greenhouse effect must remain a hypothesis.” Now we have evidence that the planet is warming, but there’s still a contingent of denier who says, “Yes, but…” Yes, but the planet’s temperature has always fluctuated. Yes, but there’s no evidence that this warming is the result of increased C02 in the atmosphere. It’s like a game in which the rules keep changing. You tell us A and we’ll ask for B, and when B arrives, decades later, we’ll ask for C. “We’ll be arguing about this for centuries,” one of the talking heads in the doc says, citing our arguments about evolution. “We don’t have time,” he says. For all its false drama (Balog’s knee, etc. 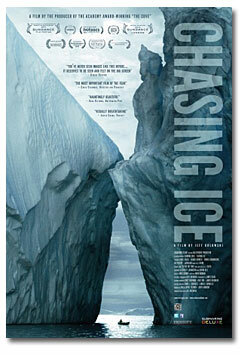 ), “Chasing Ice” is a worthy doc and worth seeing on the big screen. For the few people who see it, it will, for a moment anyway, move the issue of global warming into a more central part of their psyche, which is, at the least, what we need. Just as all of us have contributed to the problem, bit by bit, all of us must contribute to the solution, bit by bit. The first step is interest.